I seriously was having braxton-hicks while watching the Phelps finish. And don’t even get me started on the Brazilian gymnast guy competing in the floor exercise the other night, one mistake, his ENTIRE country’s hope is gone…it’s just too much. I feel like there should be soul healers (or maybe just a mother) walking around the games giving hugs. Hmmm…I could do that job. Is there an olympics suggestion box? when the Brazilian gymnast felt that weight of all of it…i started crying too. it was so sad. i think being able to volunteer for that job would be incredible. the deep hug that says, “i see you. the sum of who you are is more than this one moment.” yes, that is totally needed. I am right there with you…I just find these games to be far too stressful to watch. And let’s not even talk about the gymnastics…my creaky old flabby body has a hard time going up and down stairs let alone flipping around on bars like that…The only flipping around I do is from channel to channel…timing it to go back to the Olympics after I’ve given them enough time to either win or lose/fall off…it’s just too dramatic for me. 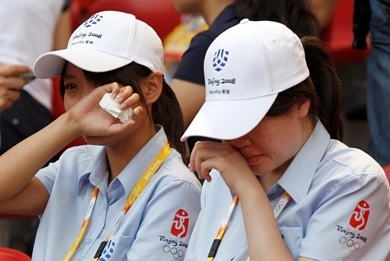 The Brazillian dude got me crying for sure, but the Chinese hurdler who injured his achilles? I shed some major tears for him. That’s too much to place on one individual. It seems to be an especially emotionally grueling Olympics, or are the broadcasters just having their way with me? Hooray! I might be the only person on the planet who stands them less than you. I don’t watch at all, and I don’t feel that I miss a thing. (I certainly don’t skip any heartbeats. )All this trumpet blare of do-or-die, life-or-death, now-or-never. My nervous system can’t tolerate that peculiar form of unkindness. I was just telling Jim last night that it’s no wonder I haven’t been watching the olympics (as we were last night), because I feel like it’s the end of the superbowl, or the NBA playoffs EVERY event. I have to get up and leave the room and then come back and watch the slow mo playbacks. I think it’s harder to watch as a mama – at least it seem that way to me. You give good hugs – you should definitely apply! I thought I was the only one – I feel SO STRESSED watching these athletes with their whole country’s hopes behind them. And we had a dismal performance (I’m from South Africa and we only got ONE medal) but I can’t help feeling sorry for our athletes with all that pressure!